Karla is a fighter in many senses of the word! 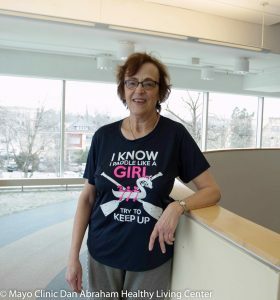 She had always been fairly active throughout her life, but after her bout with cancer, she decided to get even more active. Consequently, Karla joined the DAHLC and has been coming here three to fours days per week for the past two years. "One of the things I had wanted to do was to do a Triathlon, which I did by completing the Indoor Adventure Race 2 weeks ago." Having arthritis in her hips, she decided she wasn't going to let that worsen and keep her out of the gym. She had also lost some weight and didn't want to regain it. With her hip injury being a barrier, she also fought the negative thoughts and doubts of being able to overcome the pain. To keep her motivated, Karla and her friend meet at the DAHLC on Tuesday and help each other "train." They push each other and try to do challenging things every time they meet. Additionally, Karla mentioned how encouraging staff has been to her throughout her journey. Her words of encouragement to others include: "Just pick something you like or want to do and get started. Keep your face 'pointed forward,' keep going and do it! Having a positive attitude and doing any challenges that I can find have helped me." Karla wants to continue pushing her limits and regaining strength. She reports that the future looks brighter with her being in better shape. She hopes to participate in the Indoor Adventure Race again next year with even better times! Way to go, Karla! We are rooting for you!